Chief Technology Officer, 3DP Security, Inc.
Abstract: Most of the exciting innovations from research labs remain of academic interest. It is very difficult to develop products out of fundamental research. However, the culture of incubators and startups is helping in bridging this gap. The presentation will discuss the fundamental technology related to additive manufacturing (AM), also called 3D printing, that came out of lab to become the foundation for 3DP Security, Inc. startup. AM heavily relies on digital and cloud resources from the product design to the final printing stage. While this is convenient in today’s world, it also leads to a number of vulnerabilities in the system such as people of malicious intent can hack and introduce defects or steal the model and print unauthorized copies. Despite using latest cybersecurity tools, hacks happen! Therefore, a new security scheme is required in the AM field, where designs have significant monetary value. Our security approach is focused on developing solid modeling strategies that will allow high-quality models to print only under a very specific set of processing and printing conditions. Such information can be used by trusted partners for producing the parts, while other attempts at printing the part would result in inferior quality. In addition, strategies for tracking codes embedding inside the printed parts are also being developed to distinguish genuine parts from counterfeits. Using these advancements, 3DP Security is focused on developing a commercial product for security and product tracking. Now with the support from NIH SBIR program, the company will develop strategies for tracking genuine 3D printed medical implants. 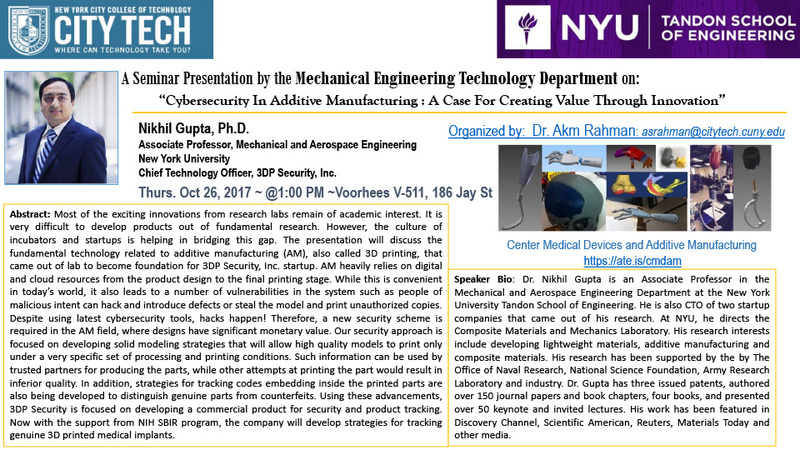 Speaker Bio: Dr. Nikhil Gupta is an Associate Professor in the Mechanical and Aerospace Engineering Department at the New York University Tandon School of Engineering. He is also CTO of two startup companies that came out of his research. At NYU, he directs the Composite Materials and Mechanics Laboratory. His research interests include developing lightweight materials, additive manufacturing, and composite materials. His research has been supported by the by The Office of Naval Research, National Science Foundation, Army Research Laboratory, and industry. Dr. Gupta has three issued patents, authored over 150 journal papers and book chapters, four books, and presented over 50 keynote and invited lectures. His work has been featured in Discovery Channel, Scientific American, Reuters, Materials Today and other media. All members of the College community are welcome.